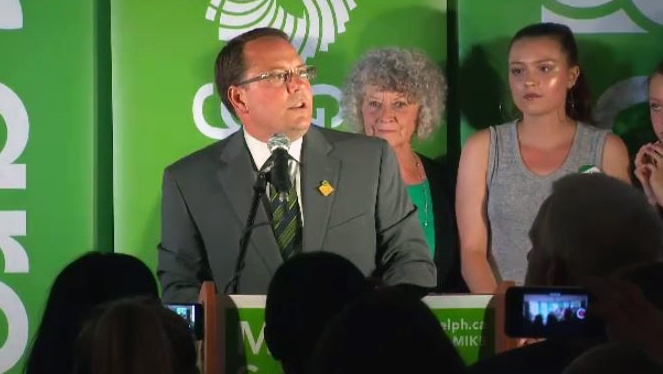 After making history as the first Green Party member elected to Queen’s Park, Mike Schreiner says his main focus will be on the people who put him there. Speaking to CTV News following his victory in Thursday’s election, the new MPP-elect for Guelph said his first order of business would be to set up a constituency office in the community. Schreiner said he hoped the residents of the riding would see the office as a place where they could show up to talk about any provincial issues. “Serving the people of Guelph is my top priority,” he said. Unofficial results put Schreiner’s vote tally at 29,082 – more than double the amount garnered by his closest competitor, and nearly three times as many as he received in 2014. While representing the wishes of his constituents will be Schreiner’s main focus, he says he’ll also work to get Green perspectives across at Queen’s Park. He noted that incoming premier Doug Ford said during the campaign that he believed human activity caused climate change, and vowed to press Ford on taking action to minimize that effect. ”The climate crisis is the biggest crisis we face right now, and I will be working hard to make sure Doug Ford is accountable on that issue,” he said. Schreiner said he hoped to find common ground with Ford’s Progressive Conservative government on a number of issues, including support for small businesses, improving Ontario’s health care system and making housing more affordable. “We wanted to plant our green flag here and be a voice for changing the political status quo at Queen’s Park, and that’s what I’m going to do,” he said. Also called a priority by Schreiner was advocating for improved transit for the Guelph area. In addition to all-day GO train service, he said he would look for more immediate action in the form of GO bus routes better connecting the city with Kitchener, Cambridge and Hamilton. Schreiner’s victory is the latest in a string of recent electoral successes for Green politicians across Canada. Federal party leader Elizabeth May has been voted into the House of Commons during the last two elections, and the B.C. Greens increased their number of MLAs from one to three in last year’s election. Simon Kiss, an associate professor at Wilfrid Laurier University, said Green support has been slowly but steadily growing across Canada, and the party now consistently pulls in about five per cent of the popular vote. “They represent a very distinct worldview that some people want represented in Queen’s Park,” he said. Kiss said Schreiner’s win could boost the Greens’ fortunes in Ontario for the next election, given Schreiner will now be more visible as an elected MPP. He said it made sense for the party to focus on the Guelph riding, which he called “a very logical, winnable riding” for the Greens. “Guelph has a long history of being home to kind of a counter-culture and very environmentally friendly population,” he said. As much as Thursday’s results show a Guelph-led groundswell of support for the Green Party, there remains a lingering question about whether the surge is part of a permanent change or something unique to this election. Schreiner’s major increase in voter support was mirrored by a decline in Liberal support sharper than was seen in most of the province. Liz Sandals won the riding for the Liberals in 2014 with 22,014 votes, while Sly Castaldi finished fourth this time around with 6,537. Green Party leader Mike Schreiner speaks to supporters after being elected as MPP for Guelph on Thursday, June 7, 2018.